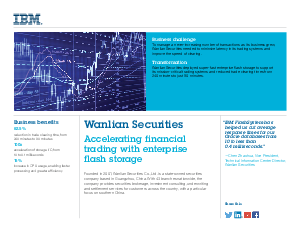 While relying on x86 servers and Oracle databases to support their stock trading systems, processing rapidly increasing number of transactions fast became a huge challenge for Wanlian Securities. They shifted to IBM FlashSystem that helped them cut average response time for their Oracle Databases from 10 to less than 0.4 milliseconds and improved CPU usage by 15%. Download this case study now.